This conversation was recorded by McLoughlin in Tig an Tober, Balliferriter on the Dingle Peninsula in 2012. The work involved six people sitting down for lunch, talking about place, the locality and their relationship to it. It was spatially recorded with multiple microphones. After lunch the space and the sound that occupied it remained. For some time, McLoughlin has been creating work that recreates and celebrates places and activities particular to a group of people. 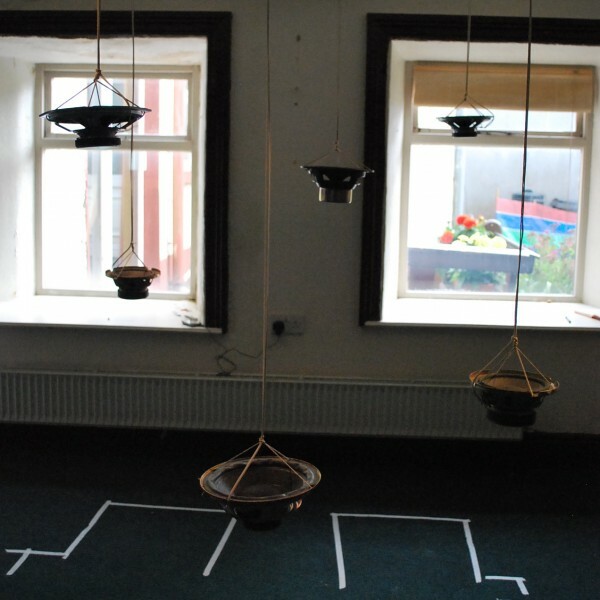 Whether it’s bingo, or handball, or snooker, or meeting for food, he explores methods of recreating space in a visual, physical, audio environment that applies an ethical aesthetic to sound based sculptural artwork in social context. There are no sound bites, out-takes, or stereo mixes of this sound work. Just a photographic record of the installation.You will have to visit the sited audio work when it’s installed to hear it and it can only be installed when everyone who was there for lunch agrees.